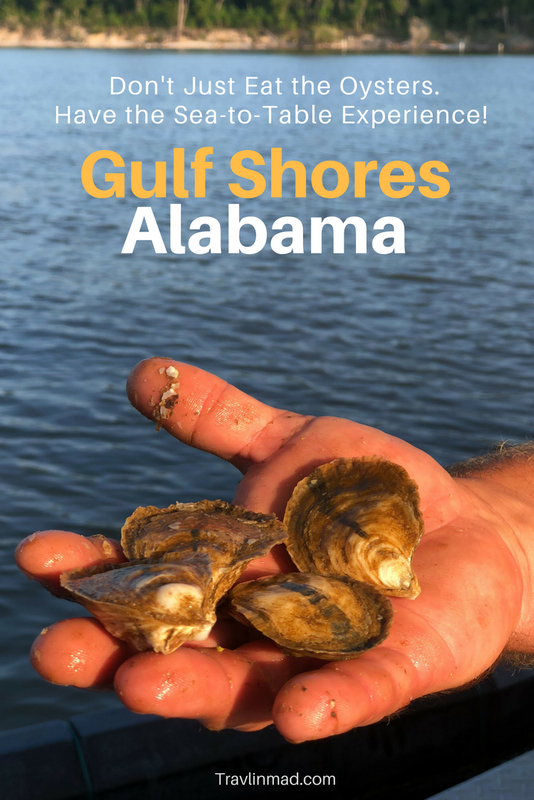 If you're a foodie or love unique local travel experiences, try this sea-to-table experience in Gulf Shores, Alabama — one of the highlights of our Gulf Coast road trip! Jarrett Frith loves fresh oysters. Even more than that, he loves farming them. And talking about farming them. All this made for a fantastic late afternoon we recently spent with him and Shellbank Selects Oyster Farm on his 28-foot flat-bottomed aluminum boat, Opossum, to see just how some of the best oysters in Gulf Shores are commercially farmed in Bon Secour Bay near Gulf Shores, Alabama. We love slow travel experiences like this that get us as close to the local food community as possible…can you think of a better way than this?! Jarrett’s boat was built in Louisiana specifically as a working boat, a really big jon boat with a small wheelhouse. Jarrett runs tours to his farm through Whiteboat Charters, and the sunset trip took about 20 minutes to cross the Bay to the site of the farm. The flat bottom made for a bit of a bumpy ride, but it was fun and dry. Jarrett and his partner, Lew Childre, have both worked their entire lives in the fishing industry and their passion and love for what they do comes across immediately. They started the farm about 5 years ago with just 5,000 seed oysters. Jarrett explained that seed oysters are produced by a specialized nursery for just this purpose and this was what they could afford when they started. So they kept their jobs and literally jumped in. It's amazing what they had to do to get started and conform to the State laws that regulate fisheries. They selected Bon Secour Bay for its excellent growing environment, and the Shellbank peninsula provides a windbreak during storms which keep the baskets from breaking loose and floating away. The width of the farm was determined by a lateral distance measured along the shoreline and then extended no farther than 1800 feet from the shore into the water. So much initial planning - and expense - was involved. Between researching changing tide levels, the threat of hurricanes, siltation - or runoff from the shore - bringing pollutants into the farm which could kill the oysters or make them unfit for consumption, the process took about a year. The biggest initial expense was an underwater archaeological survey to determine if there was anything under the water or mud that would be of historic significance. And all this before a state permit could be gotten and the first oyster could be planted! As the boat drew closer, we could see rows of parallel black floats bobbing in the water - we were here. This was the farm. Jarrett throttled down and brought us right up next to a line of floats that suspended baskets containing the growing oysters. The floats keep them above the bottom and out of the mud, and are connected to each other via a long line that's anchored to stay in place. This float and basket system was originally designed and used by Canadian oyster farmers, and takes scheduled trips to the farm at regular intervals to tend to the oysters, or harvesting to fill orders. This past year alone Jarrett and Lou have seeded and tended to over 320,000 oysters, to satisfy the demand for excellent quality oysters at seafood restaurants in Gulf Shores and throughout the gulf region. Each basket must be brought out of the water and the inner baskets containing the oysters are shaken to keep them from attaching themselves to each other and forming a clump. Other times the oysters are tumbled in a large perforated pipe that Jarrett and Lew have fashioned to break off the lip that forms at the widest part of the shell. Breaking this lip off forces the oyster to alter its shell and produces the cup shaped shell preferred by restaurants. The cup shape makes for a better presentation and keeps the liquid nectar enjoyed by oyster lovers from draining off when they're put on ice. The oysters are then cleaned and shipped as far away as Houston, Texas. Jarrett has clearly done his homework and is a wealth of information. He also seems to genuinely enjoy giving tours and sharing that knowledge with guests. We learned more about oysters and farming Alabama oysters than we ever would have imagined. It was time to put Shellbank Selects oysters to the test. And the best way to do that was to try some for ourselves. When it comes to choosing an original oyster house, Gulf Shores has several. But Jarrett recommended The Royal Oyster and it was the perfect spot. Take a look at those beauties. They were excellent - tender with just the right amount of brininess - and some of the very best we've had during our Gulf Coast Road Trip! Nothing goes better with fresh oysters than a cold draft beer or the perfect Bloody Mary. And how perfect is this one with the Slim Jim on top?! If you love unique foodie or farm-to-table experiences, this one in Gulf Shores is a must. This fresh seafood is what makes Alabama one of the most unique destinations in the US for foodies. It's always nice when you can know exactly where your food comes from, especially when your food is this delicious. Many thanks to Jarrett and Gulf Shores & Orange Beach Tourism who hosted us on this special experience. As always, all opinions are our own.